Backstory. First off, Sena and Jovan are awesome duo – which is wonderful because they’re about to turn from a cute college romance story between two beautiful talented people into a cute college romance story between two beautiful people with wedding rings. In fact their wedding is one of the main reasons I’m coming back to the states in June. I got to know Sena in highschool, in the one art class that was offered… a welcome break from a day filled with translating the run-on sentences of Virgil and listening to a US history teacher talk about everything in the world but US history. The summer after highschool, at her prompting, we took a series of ballroom classes in a studio above Urban Outfitters on Mass Ave and Newbury st… but I think our friendship was locked in when she invited me over to her family’s cool brownstone and taught me to make dumplings (one of my favorite party activities to share to this day). They also had a giant-red-retro-robot-shaped-cotton-candy-machine in their living room. Cool family. I didn’t have any good ideas for my socks until the night before, laying in my bed. I rolled over before passing out, grabbed some pen and paper, and blindly scribbled down my fading-into-dreamland idea. The next morning I brushed my teeth (I think) and remembered the piece of paper. I stumbled back to examine. 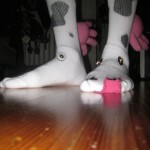 “Cow Socks.” It said. Ok.
2 hours before running off to the party, I ran out and bought the buttons for the eyes. I found a pair that looked just like eyes and another with Xs that inspired the dead/drunk cow. I didn’t want identical socks. Not fun. The little girl’s pink gloves I picked up at TJ max, on sale, next door. “For your your little girl?” asked the smiling woman behind the register. At home I cut some cow-spot-shapes from a piece of cardboard and stenciled on the black patches with black spray paint. Then I stuffed the gloves with batting for upholstering and sewed them to the back for the utters. I actually did that while wearing the socks to make sure it was in the right place. Lastly, I sewed on the eyes and drew the mouths with a sharpie. The dead cow was not quite dead enough, so I took a piece of material from the tiny hat that came with the gloves and sewed it to the sock under the ball of my foot… a big fat tongue flopping out. Felt funny when i walked. Well… I was pretty proud of my fairly ridiculous creation. I wore them to a party beforehand and got a lot of questions. When I arrived in southie I was greated by like-minded, fuzzy, friendly, colorful sock wearers. I left the party, after a heated “best in show” competition with another couple (with a great matching set), with the trophy of two movie tickets somehow stolen from Sena’s parents. Nice. 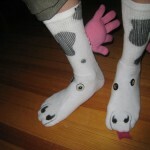 When I moved out of MalvernaBrown to run off to South America, I had to let go of some things… and the Cow Socks were left at Boomerangs, a favorite second hand store in JP that has provided me with many a cool item in the past. Hopefully they’re in a loving home. 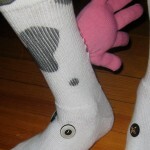 I can’t believe you let your award winning cow socks go!…. so sad. hope they found a new home. haha… but I totally understand, when you’re moving, you have to make those tough cuts. you are too kind with all the nice things you said about Jovan and me. So glad that you can make it to our wedding!